Hand held portable data collection devices are used when information at various locations must be collected and it is either too costly, error prone, or difficult to perform at or near a host computer. Some examples of tracking applications that require the use of mobile hand held PDT data collection devices include warehousing and inventory, asset tracking, and field service. Hand held PDT's can be custom configured and programmed for various applications but the most common configuration is as follows: The main display menu will provide options to choose from. When a selection is made usually the first prompt will be USER (who is doing the scan), followed by LOCATION (where is the scan occurring), and finally ITEM (which item is being scanned). If it is an inventory application the user is also prompted for QUANTITY (the number of items). The data can be entered via the keypad or by scanning (reading) bar codes. A smartphone typically utilizes its camera for scanning a barcode. This is a slow process when a lot of bar codes need to be scanned. For intensive scanning applications, an allocated portable data collector is still the way to go: quick scanning, easier aiming, better battery life, ergonomic pistol grip availability, and much better durability. The battle between Android and Windows may not be far from over. Windows was always the cat’s meow in the auto ID and data collection industry, with an emphasis on security. However, it has been over 6 years since Windows Mobile was released. 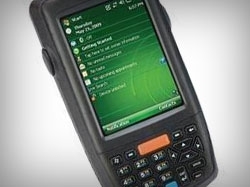 Security is now an issue on Windows CE devices, with lack of overall support for the old Microsoft OS. While Microsoft is still aiming to have a single operating system for all of their devices, Android is much more common today. Auto ID firms such as Zebra are investing heavily into Android offerings and applications. If the system and PDT are wireless RF (radio frequency), the system is updated instantly in real-time. However, most applications work well with "batch" data collection and "batch" PDT's: after all necessary data and information is collected and scanned, the data is later uploaded into the host computer, which updates the tracking software. The uploaded files can be transferred into an ASCII file, Excel spreadsheet, or directly into a tracking software package. For companies who still use a pen and paper while collecting data, an investment in hand held data collection devices will reduce redundancy and increase accuracy, while increasing the bottom line.